James Michael has been operating in the building industry since 2006 and has developed a deep knowledge and understanding of the construction industry. His experience includes high quality building and carpentry and managing multiple sites within NSW. He is familiar with all aspects of building and carpentry including customer liaison, pricing, scheduling suppliers, marketing a building company, payment terms and requirements, work safety and OH&S issues. Throughout his time in the building industry, James Michael has built a reliable list of all quality suppliers in addition to reliable sub-contractors. 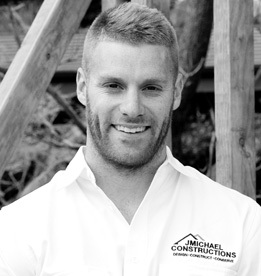 James Michael formed JMichael Constructions Pty Ltd as a company specialising in architecturally designed high quality residential projects and intends to offer building services to the general public. JMichael Constructions will specialise in high quality projects in the eastern suburbs region and which are in close proximity to his offices in Rose bay, Sydney.